One of the crucial aspects of the Chancellor’s Budget was the commitment to raise the living wage for over 25s to £9 by the year 2020, a rise from the current rate of £7.20. Our immediate post-Budget research showed the policy to be very popular – across supporters of all of the main political parties. Eight in ten (80%) said the policy was a good idea, whilst just 9% believed it to be the wrong priority at this time. In recent days, one brand which has announced it is embracing paying staff the living wage at the very least, is Ikea. It becomes the first national retailer to commit to this standard of staff pay, which will benefit more than 4,500 employees. Ikea believe the move makes good business sense; viewing it as an investment in employees, and a way to create a positive environment for shoppers to enjoy. It also compliments the already positive yet quirky image Ikea has built-up in the near three decades it has had a presence in the UK. YouGov BrandIndex data underlines how popular Ikea already is among UK consumers. They are currently comfortably in first place out of 45 brands in our Buzz score rankings list of general retailers, indicating the public has heard consistently positive news about the brand. 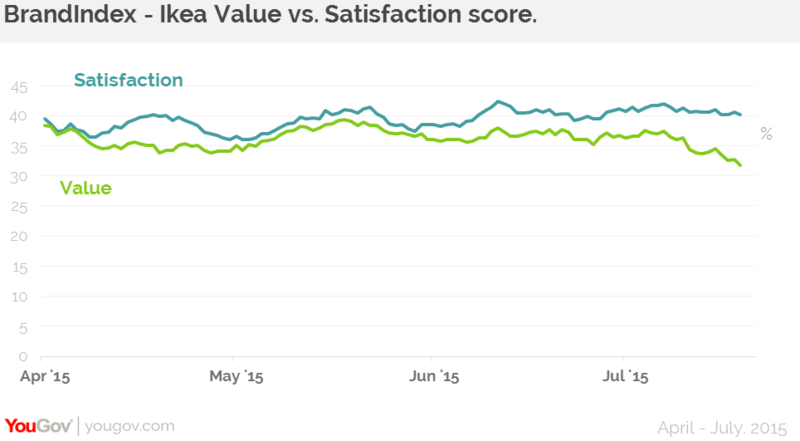 Price remains at the core of Ikea’s appeal, its Value score is a healthy +32. YouGov’s Satisfaction metric also hints at Ikea’s enduring appeal, the current score stands at a strong +40, indicating that the products bought at Ikea have found happy homes. One issue the company will be looking to tackle in the next twelve months is that of accessibility. With many consumers being put off by long drives to out of town retail parks, Ikea wants to increase its presence on the high street, with smaller store formats. Consumers have clearly been won over by the business’ key appeal, the challenge is to reach more customers in a modern and innovative way.